We pride ourselves on staying up to date with the most effective and best practices in the canine industry. 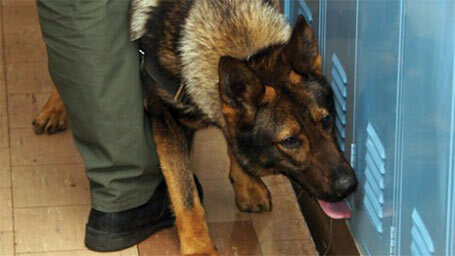 At this time we offer a variety of Police K9 Handler Courses, Decoy courses, and specialty courses upon request. Advanced Scenario Training – Home Invasion, Car Jacking, etc. This is exactly what it sounds like! If you have a dog, it doesn’t matter what discipline you train we want you to come out and get some work in at our new location in Brighton. This is a sport & working dog only event. More details will be announced closer to the date! This is strictly a law enforcement /military course. This is a basic 3-day decoy course for green handlers and green decoys to improve their skills on both sides of the leash. 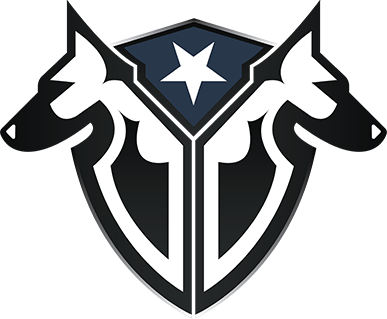 Our aim is to teach you how to properly catch a K9, manipulate drives, move into advanced real-world scenarios and how to set them up. We also cover some case law, safety for you and the K9, and go over some basic K9 information that you may or may not know. Below you can find the course outline and information sheet as well as the registration form. We are proud supporters of the online K9-FTO course. 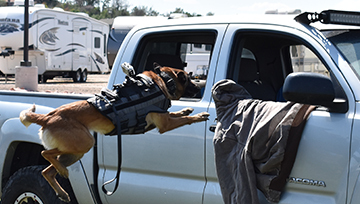 This course is designed for Law Enforcement Officers, K9 Supervisors and Private K9 Professionals. This course is online only currently but will become a classroom course with live training and scenarios in 2018. 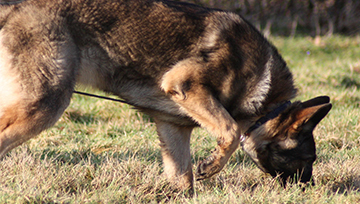 The course is designed to make a newly K9 handler’s transition to the field as effective as and efficient as possible. This course covers procedures, policies, case law, K9 maintenance and much more. Please choose your position below and use vendor code “Complete Canine” when registering. Please contact us with any questions you may have about our K9 training courses by calling us or filling out the contact form on the right hand side of this page. Complete Canine Training in conjunction with Proven K9 Training and George Vidler will be teaching basic techniques to improve your K9 and your skills. This course is designed for both dogs and decoys who want to learn and grow. 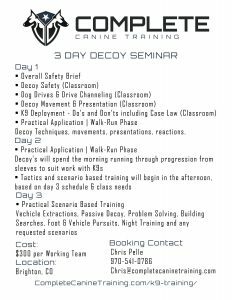 This course is our basic 2-day decoy course in San Tan Valley, AZ! During the course you will learn about decoy & Dog Safety, Reading a Dog, Drive Satisfaction & Manipulation, How To Develop Better Bites, Decoy Movement & Presentation, How and When to Apply Pressure. Become a better decoy with expert instruction and guidance from 3 of the top decoys in the US. This 3-day workshop in Loveland, CO will enhance your decoy skills. Topics will include decoy safety, drive manipulation, decoy movements, bite building and more.